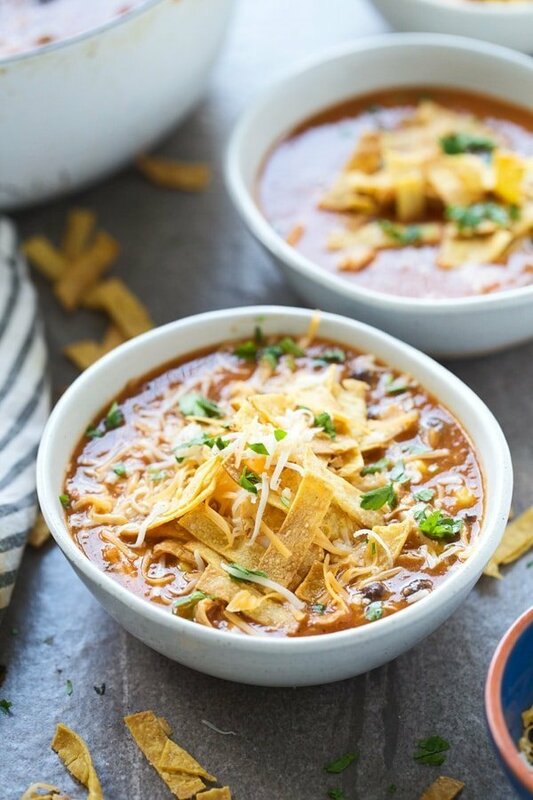 This creamy chicken tortilla soup is packed full of dried chiles, canned green chiles and uses corn tortillas instead of cream or cheese for a super creamy texture without adding a ton of fat and calories – yum! I’m one of those people who loves soup unconditionally. I adore all varieties, and I’ll even slurp it down on the hottest of summer days. 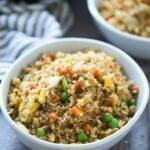 So, when winter rolls around, you’ll find soup in my meal plans at least a few times a week, sometimes more. 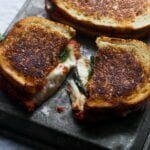 I always start winter out with the basics: Chicken noodle, classic chili, or baked potato and then inch my way up to something a little bit more exciting like Butternut Squash Cheddar Soup with Grilled Cheese Croutons or Coconut Curry Wonton Soup for some variety. 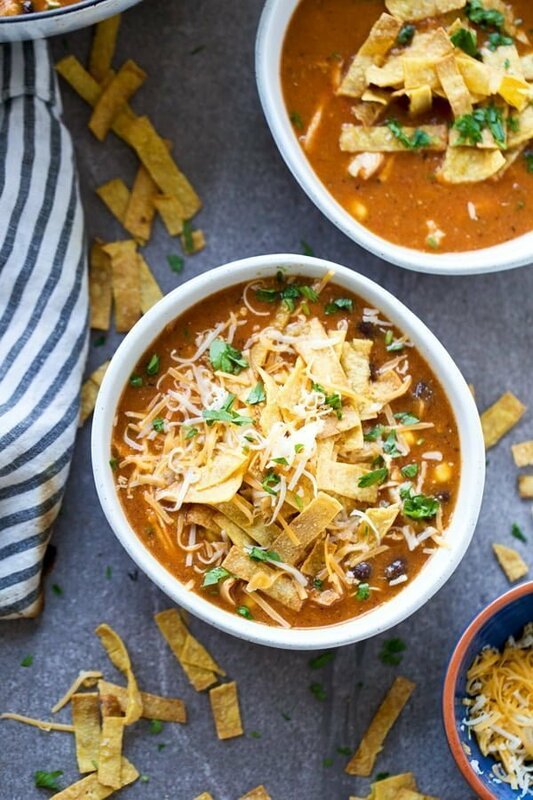 Today’s Creamy Chicken Tortilla Soup falls somewhere in between basic and elevated simply because the preparation itself is admittedly, very easy, but the flavor that comes from it, isn’t your average bowl of chicken broth steeped with vegetables. 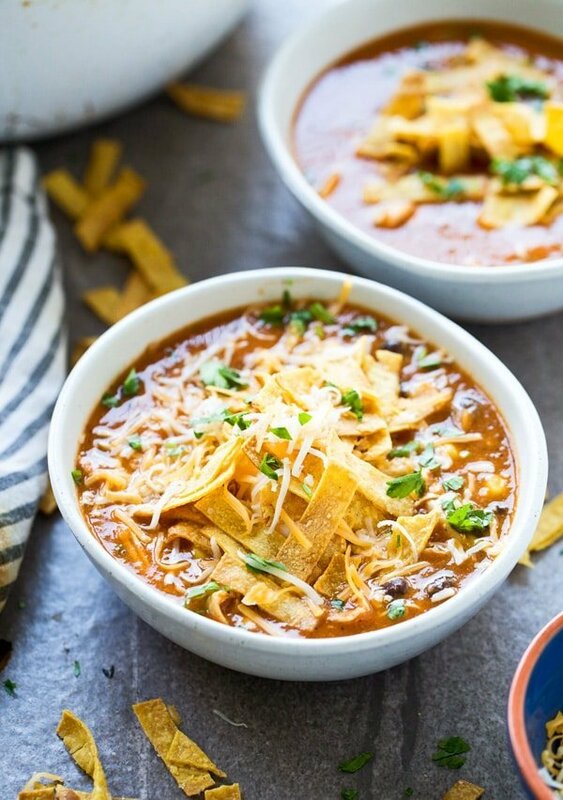 Most chicken tortilla soups are on the brothy side, which I love, but when it’s really cold out, all I want it something creamy, so this version is based loosely off of How Sweet It’s Cheesy Turkey Tortilla Soup which purees the tortillas directly in to the soup. What this does is gives off the elusion of cream without having to actually add it in, and since corn tortilla are naturally lower in fat and calories than their flour counterpart, it adds the perfect amount of creaminess without any additional guilt. For flavor, I of course used plenty of onion and garlic, but also threw in a few dried chiles I had on hand as well as a can of diced green chilies, an ingredient I almost always throw into tex mex-inspired dishes. For this particular soup I used Chile de arbol peppers, which have a pretty intense spice to them, so a little goes a long way. 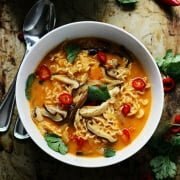 I used two here, and it produced a very spicy broth (which we love! ), but if you’re sensitive to spice, then one should do the trick. They’re typically available at most supermarkets, but you can also purchase them on Amazon, Whole Chile De Arbol, 3 Ounce – Mexican Whole Dried Arbol Chili Peppers ” target=”_blank” rel=”nofollow”>here. I think people are often intimidated when it comes to dried chiles, but honestly, they’re so easy to work with, especially in a pureed soup. All I do is de-stem them, break each one open to scoop out the seeds and then throw them in along with everything else. When the soup gets pulverized in the blender, the chiles do as well. So here’s how it goes. Onion and garlic are sautéed in a bit of olive oil as most soups begin, and then from there, it’s pretty much dump, stir, simmer. Chicken stock, canned geen chiles, dried chiles, some cumin, plenty of salt, oregano, a can of tomatoes, and some smoked paprika are added in, the whole pot is bought to a boil and then reduced to a simmer for about 10 minutes. After 10 minutes or so, the corn tortillas go in, the soup is simmered another five minutes and then it’s blended with an immersion blender. I like for my soup to retain a little bit of texture so I stop blending just shy of completely smooth, but you can take it as far as you like. Once everything is blended, shredded chicken (I used rotisserie), frozen corn and a can of black beans go in and it’s left to simmer again until all the added ingredients are nice and cozy in the broth. 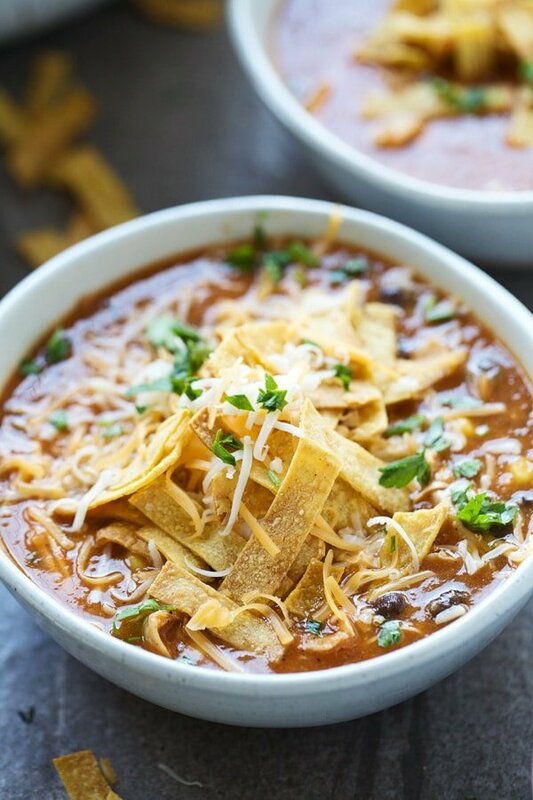 A final seasoning of salt and pepper finish the soup off and it’s served with lots of shredded cheese, chopped cilantro, sour cream and crispy tortillas strips. 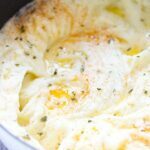 If you want to keep things light (I do), use light sour cream (never non-fat!) and reduced-fat cheddar cheese in place of the full-fat stuff. 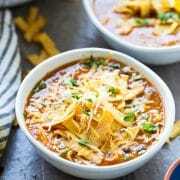 This creamy chicken tortilla soup is packed full of dried chiles, canned green chiles and uses corn tortillas instead of cream or cheese for a super creamy texture without adding a ton of fat and calories. Preheat oven to 350 degrees. Cut 4 corn tortillas into strips. Spray with non-stick cooking spray and spread on a large, rimmed baking sheet. Bake for 10-15 minutes until golden brown and crisp. Toss halfway through to prevent burning. Set aside. While tortillas bake, heat a large stock pot to a medium heat. Add olive oil. Once oil is hot, add onion. Saute for 2-3 minutes until slightly softened and fragrant. Add garlic and 1/4 teaspoon salt. Saute until garlic is fragrant and onion is completely softened, another 2-3 minutes. Add cumin, coriander and chili powder. Stir and then add chicken stock, canned chiles, dried chiles, canned tomatoes and remaining salt. Bring to a boil, then reduce to a simmer. Simmer for 10 minutes. Tear remaining corn tortillas and add to soup. Simmer another 5 minutes. Use an immersion blender to blend the vegetables and tortillas into the broth. I like to leave a little bit of texture, but if you like it smooth, puree completely. Add chicken, corn and black beans. Stir and simmer another 5-10 minutes. Season to taste with salt and pepper. 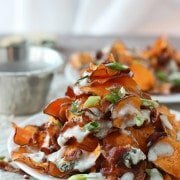 Serve with shredded cheese, chopped cilantro, sour cream and crispy tortillas chips. 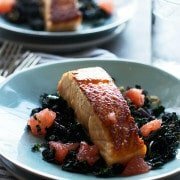 Recipe inspired and adapted from How Sweet Eats. 5 Responses to "Creamy Chicken Tortilla Soup"
I’ve a query related to this recipe. What did you mean by ‘medium heat’ in the article? Can you please specify this? You turn the stove on medium, so if it ranges from 1-10, a five or six. I tried this last night and it was very good. Funny story, I made one mistake by somehow thinking I was supposed to add the beans in before blending so I sat there with a spoon taking most of them out LOL. Haha. Oh no! It would have been fine with them in there!